2. 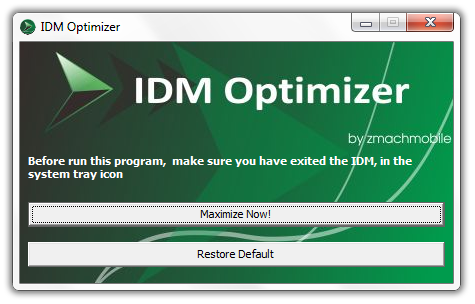 Now make sure IDM is installed on your PC, now just fire up your IDM Optimizer and than you will see Window like above just click on Maximize Now and you will get a note asking you to restart your IDM do that and once restart your PC. 3. That’s it now your IDM is boosted with speed, try to download any file and check out out if speeds are good or not. 4. If you want to restore your default settings than you can click on Restore Default. 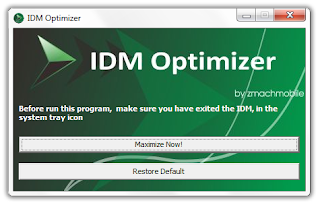 That’s it guys now you have boosted your IDM with Speed, optimized it for faster downloads have fun :) and do share this post with all friends.